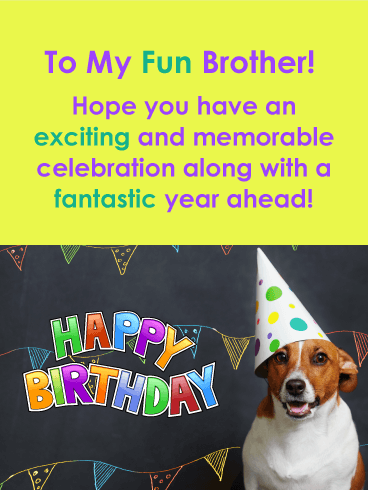 Send a fun and colorful birthday card to your brother this year for his big day! This awesome birthday card features a dog wearing his birthday hat. So cute! The wavy birthday streamers in the background match the Happy Birthday lettering and give it an element of fun! 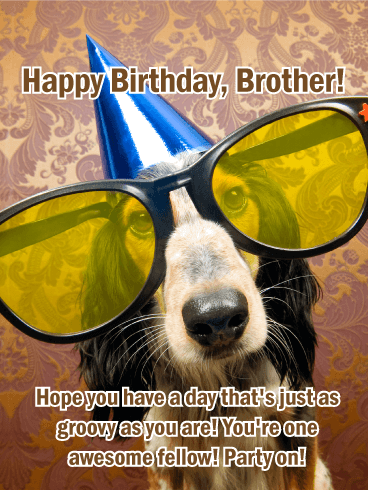 Wish your brother an exciting and memorable celebration with this great birthday card today! It's your brother birthday, and that can only mean one thing, that it's time to get the party started. This birthday card will put a smile on your brother's face when he sees that this puppy is ready to start the celebration. This fun birthday card showcases an adorable puppy wearing a birthday hat and sunglasses! He sits in front of a wonderfully festive background with streamers and sparkling lights. Send this little guy over to your brother soon! We write down dreams, little notes for our brains and hearts, and then stare at them wistfully. Well, tell your brother to stop being lazy and go after them on his birthday! Anything can happen on birthdays, including all of your wishes coming true. 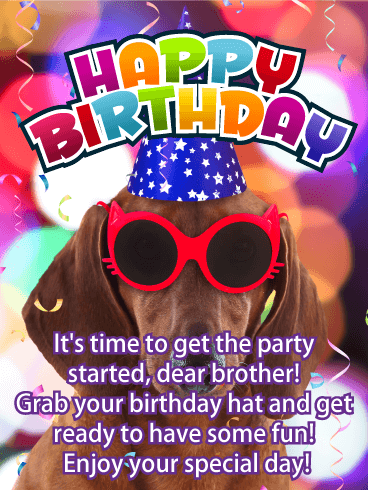 So send this determined dog to your brother on his birthday and let him know you have his back! Any birthday card is automatically so much more awesome with a dog on the front, and this one is no exception. Just look at that sweet face! Add in the party hat and that drool-worthy layered cake and you have a full-on party. This card is the perfect balance of fun and sincerity, with a sweet sentiment that is sure to bring a smile to your brother’s face. If your dream birthday card for your brother is one full of fun and laughs, we've got the perfect one for you. For starters, the retriever is absolutely adorable, with a sweet smile that's sure to make anyone smile. The picture on the top half of the card says that you're ready to party with your brother, and the bottom half just reaffirms it. 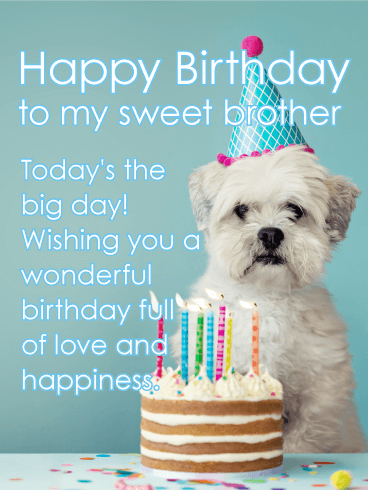 This is a great card for your awesome brother! 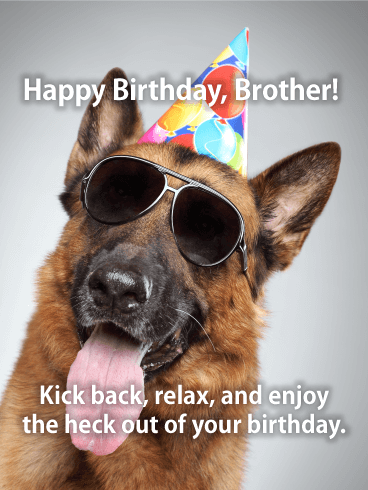 This cool K-9 has a special birthday message for your brother. Kick back, relax, and enjoy the heck out of your birthday! That's good advice on every birthday; heck, it's good advice for every day! If your brother is a chill guy, loves dogs, and likes to smile-this is probably the card for you! 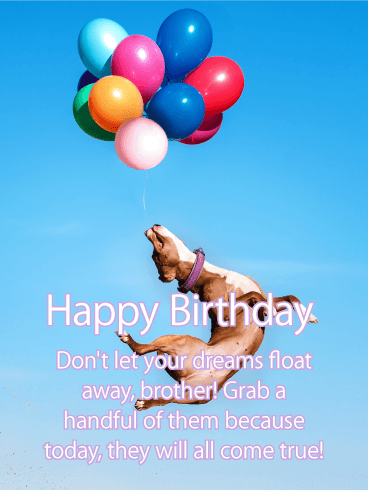 Wish your brother a happy birthday and send this fun birthday card today. Lookin' good bro. Happy birthday. This slick birthday card is both classy and ridiculous, kind of like your brother. But the birthday message is thoughtful, so you get the best of everything all in one hip birthday card! What is not to love about a French bulldog in sunglasses posing peace sign? 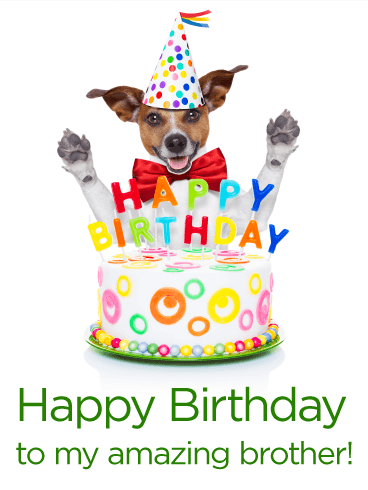 Send this hilarious pup to your brother on his birthday so he can celebrate in style. If you have a brother that was always looking out for you, and still is, then this cute and funny birthday card would be perfect for him! It will certainly brighten your brother's day. It features an awesome photo of a dog wearing a red cape, giving him a super hero appearance. 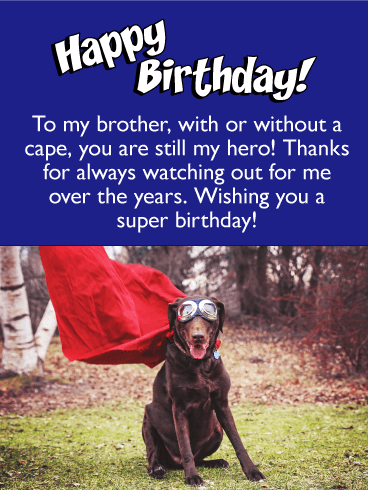 Sending this birthday card is a great way to thank your brother for watching out for you over all these years! You both may be getting on in years, but that doesn't mean you've lost your ability to have fun! 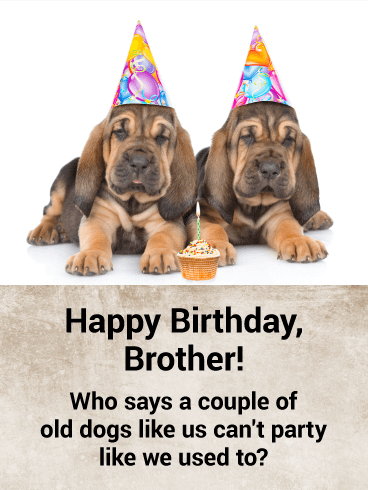 For a brother who may not be looking forward to adding another candle to his cake this year, remind him that he's still got a lot of bark left in him with this hysterical funny birthday card, featuring two doggies who love a good birthday celebration! Is your brother a cool dude? Does he deserve a birthday card that shows how awesome and cool he is? If so, then you've found the right one! This Happy Birthday card has a picture of a dog who is just as cool as your brother. 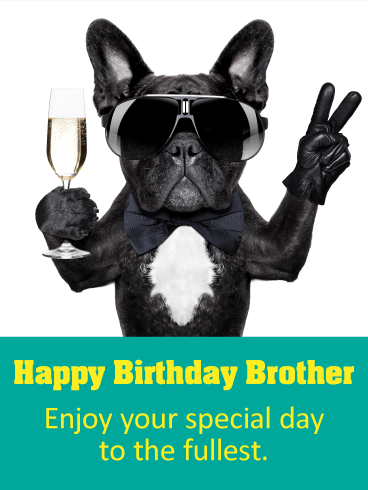 His sunglasses, bowtie, gloves, and champagne will make your brother laugh and give him sweet birthday wishes on his special day! Is your brother your best friend? Do you want to send him the perfect card for his birthday? Then you've found the right one! 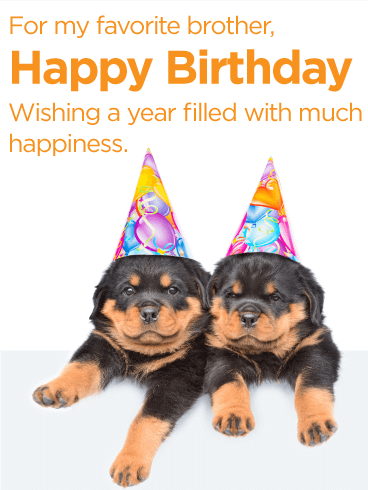 This Happy Birthday card shows two adorable puppies who are super close - just like you and your brother! Bring a smile to his face and help him have the best birthday ever by sending your birthday wishes with this card! It's your brother's birthday! To celebrate this special day for such a special person, you need the perfect birthday card. 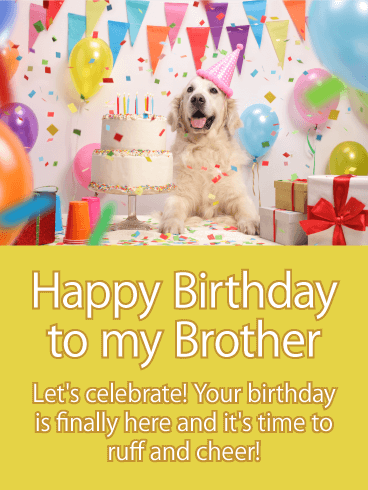 This Happy Birthday card features bright colors, a yummy birthday cake, and a cute dog that is happily celebrating your brother's special day! 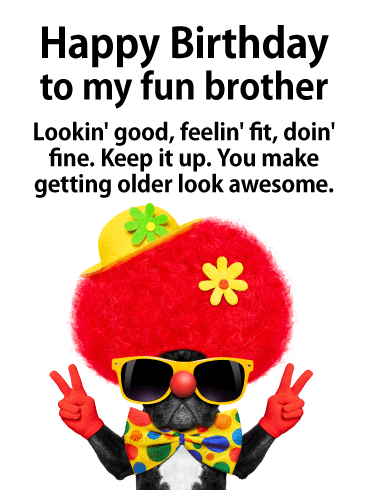 Make this an amazing day for your brother by sending him this colorful, cute, and fun birthday card today!